Colorado Parks and Wildlife says that it found a deer that was infected with Chronic Wasting Disease just east of the city of Montrose in Game Management Unit 65. The deer, found last spring, died on private property. The disease was confirmed by Colorado State University's western slope veterinary lab. This is the first time a deer infected with CWD has been found in the southwest part of the state. CWD, however, has been present in northern Colorado, for many years. It has also been found on the plains and in some areas of central Colorado. CWD is a neurological disease found in deer, elk and moose in North America that is fatal to the infected animal. The disease attacks the brains of the animals and causes them to become emaciated and uncoordinated. Studies by state and federal public health officials have found no relationship between CWD and human health problems. However, the Colorado Department of Public Health and Environment and the Colorado Parks and Wildlife advise hunters to take precautions when handling deer, elk, or moose carcasses. Hunters in GMUs 62, 64 and 65, who harvest any deer this fall, will be able to have the animals tested at no charge by Colorado Parks and Wildlife. Anyone who picks up a road kill deer in these units also can have the animal tested at no charge These GMUs are those located around the city of Montrose. 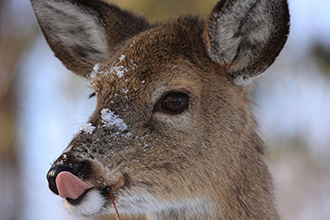 To date, CWD has been found in 77 of the Colorado's 186 game management units. Hunters who harvest deer, elk or moose in any other GMU in the state can submit their animals for testing for a $25 fee.